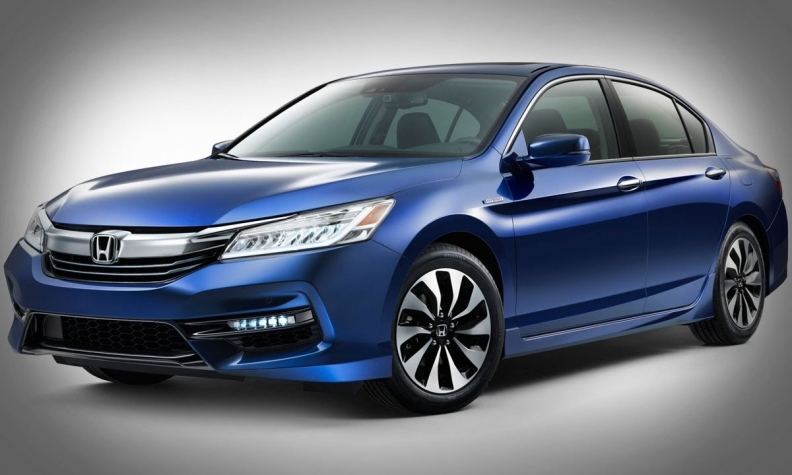 The 2017 Accord Hybrid will start Honda's electric push. TOKYO -- Honda sells hardly any hybrid vehicles in the U.S. today, but CEO Takahiro Hachigo says get ready for an explosive ramp-up. By 2030, he wants more than two-thirds of U.S. Honda and Acura volume to come from green cars such as traditional hybrids, plug-ins, fuel cell vehicles and EVs. At today's U.S. sales rate, that translates to a sales volume of more than 1 million electrified vehicles a year for American Honda Motor Co.
An ambitious plan? No question. By comparison, American Honda sold just 2,329 hybrid vehicles in the U.S. through June of this year. It also assumes huge change in its products. The company that made waves by bringing the first hybrid to the United States in 1999, with its pod-like Insight two-seater, now sells only four electrified models: the Honda Accord Hybrid, the Acura RLX flagship sedan, the high-end Acura NSX sports car and the remaining stock of the soon-to-be discontinued CR-Z hybrid hatchback. An Acura MDX hybrid crossover should arrive soon. But facing tepid demand, Honda dropped the Civic hybrid and Insight in addition to the CR-Z. Hachigo spelled out a worldwide vision for 2030 in February, saying the automaker aims to get two-thirds of its global sales from hybrids and zero-emissions vehicles. But in an interview this month with Automotive News, he said U.S. penetration should far exceed that global two-thirds. "For the U.S. as well, we will be deploying plug-ins as the core and bringing in other electrified technology," Hachigo said. "The ratio will be far higher in the U.S."
Honda says increasingly stringent emissions standards require the ramped-up electrification. The U.S. rollout begins with a new plug-in hybrid sedan arriving in 2017, he added. It is expected to be part of a trio of Clarity-badged green cars. That lineup kicks off with this year's arrival of the Clarity hydrogen fuel cell sedan. An all-electric Clarity will join later. A hybrid Civic and possibly a hybrid CR-V crossover are also likely to arrive by the end of the decade. Some analysts question whether Honda can achieve such a U.S. target. "The stumbling block for them is their dealers told them they don't want them," Christopher Richter, an auto analyst at CLSA Asia-Pacific Markets, said of U.S. demand for hybrid vehicles. "Unless there's a change in what dealers want, I don't think they are going to get there that fast."